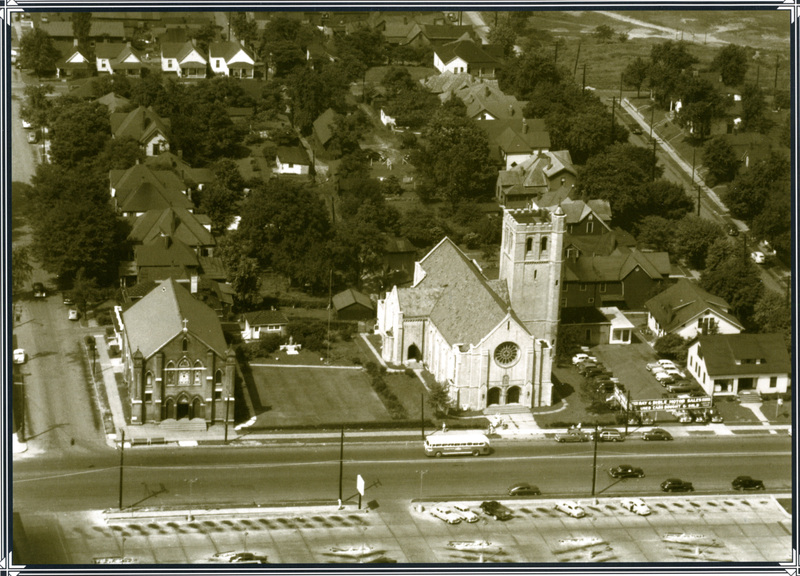 Holy Ghost Parish in the 1950’s. The old church is to the left. Notice the used car dealership to the right of the new church. Knoxville’s second Catholic parish came to life in the early 20th century, when Bishop Thomas Byrne commissioned Father James Lorigan, assistant pastor of Immaculate Conception, to build a new church in North Knoxville. 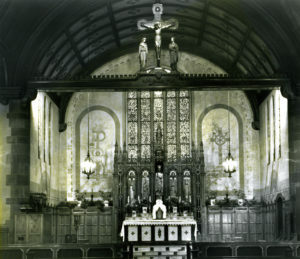 The announcement about the new parish, to be named Holy Ghost, was made, not coincidentally, on the feast of Pentecost in 1907 from the pulpit of Immaculate Conception Church. Built in 1908, the original church featured an altar of Tennessee marble. It served as the parish’s church until 1926, when the current building was dedicated. 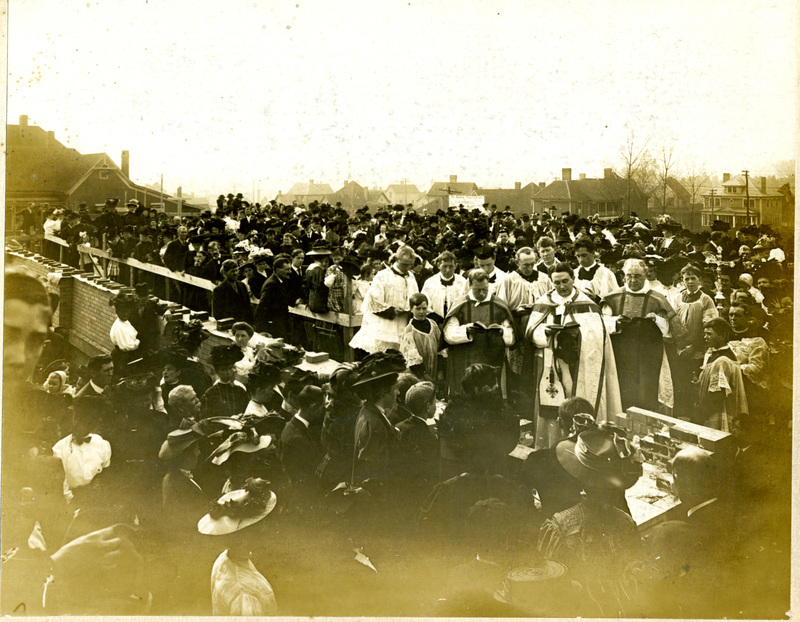 Father Lorigan was named Holy Ghost’s first pastor, celebrated its first Mass, and baptized its first infant, James Edward Harris. Holy Ghost School (now St. Joseph School) opened in September 1908, with 80 students and was managed by the Sisters of Mercy. Holy Ghost’s fourth pastor, Father L. J. Kemphues, announced plans for construction of a new church. Cincinnati architects Crowe and Schulte were retained, along with Knoxville contractor J.M. Dunn and Son, to design and build the current Indiana Bedford stone Norman-Gothic structure, one of the most beautiful churches in Tennessee. 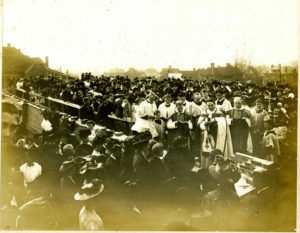 The groundbreaking took place in 1925. A year later, the new (and current) Holy Ghost Church was dedicated. Performing for the occasion were a 20-piece orchestra and a large mixed choir. 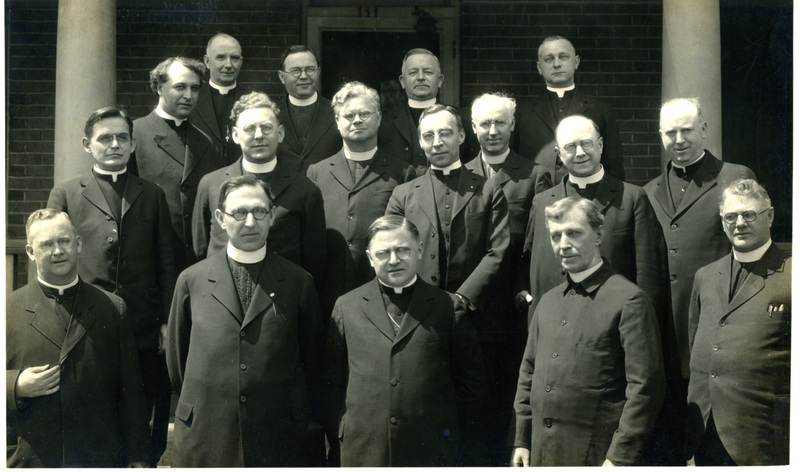 During the pastorate of Father John V. Cunningham, the church experienced its first crime. 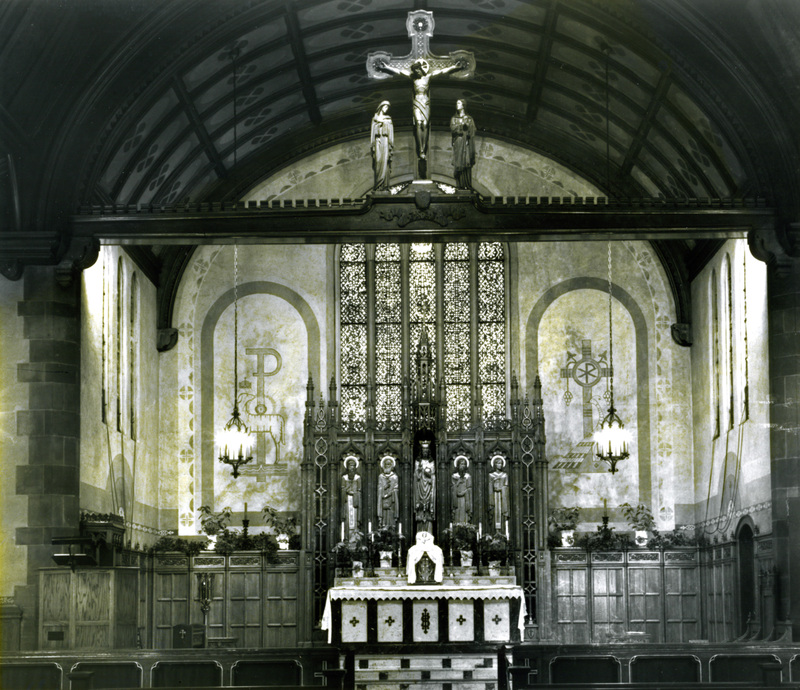 Three days after Christmas 1931, the tabernacle and Blessed Sacrament were chiseled from the altar and stolen. They were found undisturbed three days later in a vacant house downtown. Father Joseph P. Follman served the parish for 16 years, until his death in 1954. He eliminated “pew rent” and installed automatic kneelers, a new pipe organ, and two side altars. He began the use of missals and formed a Catholic youth organization and an all-male choir, in line with Vatican directives. In 1943 he founded the Knoxville Ladies of Charity. This legacy of support for the area’s poor continues today. In the mid-1940s he purchased a convent for the Sisters of Mercy, the white clapboard house at 114 Hinton Avenue. 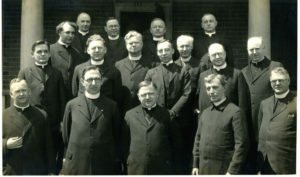 Holy Ghost priest group, date unknown. During the four-year pastorate of Father Leo Baldinger the convent was remodeled, and planning began for a new elementary school. But St. Joseph School became a reality in large part through the efforts of Father Baldinger’s successor, Father Albert J. Henkel, who set the record as longest-serving pastor. One of Father Henkel’s greatest accomplishments was helping to make the church debt-free. On Pentecost Sunday 1976 the mortgage was burned to celebrate the achievement. 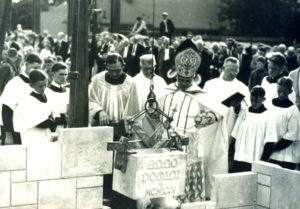 In June 1990 Father Henkel hosted the first ordination to take place at Holy Ghost Church. Father James Vann Johnston Jr., who served as associate pastor and in March 2008 was made bishop of Springfield–Cape Girardeau, Mo., was ordained a priest by Bishop Anthony J. O’Connell, Knoxville’s first ordinary. Father Henkel died on Dec. 26, 1996. 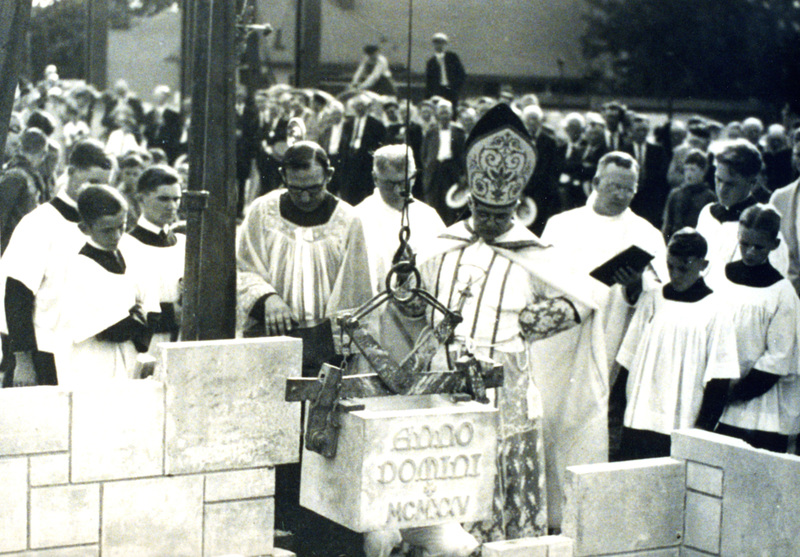 Several months after Father Henkel’s death, one of his former associates, then–Father Xavier Mankel, was named Holy Ghost’s 10th pastor. In his short time at Holy Ghost, he has renovated the rectory and the church basement, reinstituted the parish pastoral council, led expansions at St. Joseph School, and initiated numerous projects to affirm the beauty and architectural significance of the church. Father Mankel was made monsignor in 2006.